All my life I have been a browser of dictionaries, a Sunday-afternoon flipper of phone books, a belly-on-the-carpet peruser of atlases and anthologies. I’ve been a geek for information since I picked up my first children’s illustrated encyclopedia. But I also love a good story, which is probably why I read essays. Who can resist the genre’s uncanny alchemy of information and personal narrative steeped in the mind of a thoughtful observer? Life is chaos, as information is chaos, but the essay reveals order, structure, and meaning in both. It’s the kind of literature that helps us find, rather than escape ourselves—the essay as atlas to the heart, dictionary of our own self-definition or, as Mary Cappello describes it in her new book, an almanac to mood. 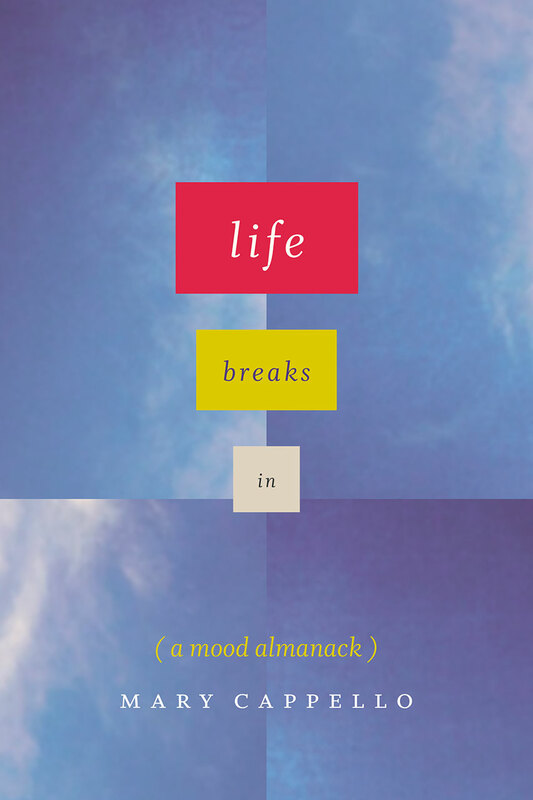 Cappello’s new collection of essays, Life Breaks In: A Mood Almanack, is a 300-page thought experiment on mood, but calling it a collection doesn’t do justice to the scope of Cappello’s project. These essays don’t merely play off one another. They are distinct, stand-alone attempts at describing the often ineffable nature and origin of mood, part and parcel of one another—much the way that moods themselves are distinct and unique, but collectively make up the reality of who we are. If you’ve read her book Awkward: A Detour, you’ll recognize in Life Breaks In what I call the Cappello Approach. It’s a disciplined, if idiosyncratic, dive into a subject, a Mariana Trench-level exploration that defies metaphor, or else demands a mixing. She’s not only turning her subject over to see it from every angle, but cutting it open, and cutting it up, tincturing bits in alcohol, grinding some into powder, spinning some in a centrifuge. Her subjects go under the knife and under the microscope; she looks under the hood and under the bed. The Cappello approach is to the essay what I imagine the Swiss Army knife is to the toothpick, what Majong is to tic-tac-toe. In Life Breaks In, she confesses her love of “writing that resists its reader.” “I’m suspicious of the easy invitation that bows to protocol,” she writes. “Or the stuff that chatters recognizably, incapable of interestingly interrupting my day by making my heart skip a beat or requiring that I listen with my eyes.” Studious. Funky. Playful. Brooding. This is not a book you bring to the beach. But that doesn’t mean it isn’t a joy to read. On the contrary, Cappello is the best kind of daunting. Life Breaks In is inspiring in the way of performances by preternaturally gifted musicians and athletes—a “wouldn’t it be great if I could jump that high, pluck strings that beautifully, sing with such grace, pull a double-pump-fake lay-in from under the rim with my tongue hanging out” type experience; except, it’s not Mike I want to be like, but Mary. How about a classical author comparison? Cappello is at times as cerebral as Bacon, but where Bacon’s essays amount to a series of declarative statements that imply an immense amount of introspection, Cappello’s work is an immense amount of introspection that implies a series of assertions. If Bacon posits himself as a font of wisdom and right thinking, Cappello posits herself as a font of curiosity and deep thinking. And her mood is never Bacon, always Montaigne. Near the beginning of Life Breaks In, Cappello claims, “in order to write or make art one must be in love, not with an individual per se, but with life itself.” And it may be Cappello’s passion that comes through most clearly in this book—a passion wide enough and deep enough to encompass life and all its many moods. Joey Franklin’s first book, My Wife Wants You to Know I’m Happily Married, won the 2015 Association of Mormon Letters book prize for nonfiction, and was a finalist the 2016 Utah Book Award. His essays have appeared in Writer’s Chronicle, Ninth Letter, The Normal School, Gettysburg Review, and many other publications. He teaches creative writing at Brigham Young University in Provo, UT, and is currently at work on a memoir about the saints and scoundrels hiding in his family tree.